Charcoal grilling is a classic method of cooking up your favorite cuts of meat and vegetables in the great outdoors. Not only does it deliver outrageously delicious flavor unparalleled to other cooking methods, there is something quite pleasurable about creating a succulent masterpiece over an open flame. When using a charcoal grill, it is important to know how to safely start it up for the first time since improper use can lead to serious injuries and accidents. If you have just brought home a new charcoal grill, you are just a few steps away from getting started. But first, you need to review all the different ways to light it up. Continue reading to do just that! There are 3 traditional methods for starting a charcoal grill. The approach you choose will largely depend on personal preference and experience; however, there are some techniques that are more recommended than others for reasons of safety and convenience. So gather up your charcoal of choice, and then check out the different means of lighting your grill! The top recommended method of lighting a charcoal grill is to use a charcoal chimney. Also known as a chimney starter, these tools are often sold separately from kettle grills, but they are cheap and can be purchased online or at any home improvement or garden store. Expect to spend between $10 and $20. To use a charcoal chimney, you will need your charcoal briquettes, some newspaper scrap, and a source of flame. Start by laying down some wads of newspaper in the bottom of the basin, stack your briquettes neatly on top, and then give them a light. If you do not have newspaper, use some pre-treated briquettes instead. 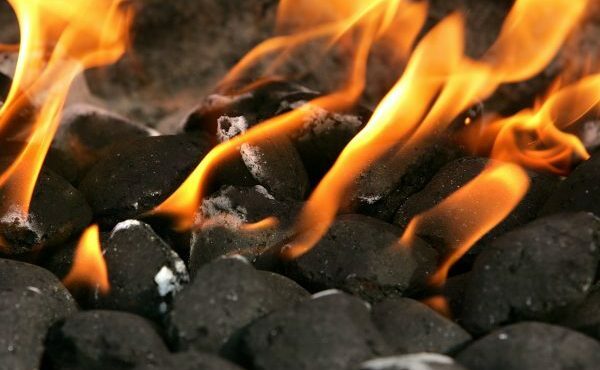 If a charcoal chimney is not a suitable option for your grilling needs, you can opt for some pre-treated briquettes. Also known as “matchlight” or “easy-light” charcoal, these are small lumps of charcoal that have been infused with a degree of lighter fluid, making them easier to light. To use easy-light charcoal, simply stack the briquettes and light them in several places. The coals should light up rapidly, but once lit, do not add more pre-treated charcoal to the flame. It is also important to allow the lighter fluid to burn off before cooking anything on the grill; this generally takes around 45 minutes or so. Lighter fluid is the riskiest method of lighting up a charcoal grill, so it should be reserved for those with grilling experience. If you do decide to use lighter fluid, be sure it is compatible for charcoal. There are some lighter fluid products that cannot be used on a charcoal kettle grill. There are several dangers to avoid when using lighter fluid too. For starters, never pour liquid lighter fluid on hot or lit coals because the charcoal can instantly flare up and burn you. And as mentioned before, you must allow the chemicals to burn off before cooking anything on the grill. Barbecue Made Easy for the Whole Family! Visit Rackz BBQ in Carmel, Indiana for delicious smoked meat entrees, hand-crafted barbecue sauces, and homemade side items, like peach baked beans, macaroni and cheese, coleslaw, and more. From appetizers and sandwiches, to salads, entrees, and desserts, there is much to choose from on our comprehensive BBQ menu, so be sure to try them all! Contact us at 317-688-7290 to ask us about our menu prices, weekly specials, and more. We accept call-ahead and takeout orders too! This entry was posted in Cooking Tips and tagged barbecue restaurant carmel indiana, charcoal grill tips, charcoal grilling facts, lighting up a charcoal grill, start a charcoal grill. Bookmark the permalink.